The rise of reflex sights on pistols has been a rapid one. It started with the hunting market, spread into competitive shooting, and is now making a scene in the tactical market. Regardless of your personal use, a reflex sight needs to have a few important characteristics. First and foremost, the red dot sight needs to be small and lightweight (in this article, we use the terms “red dot sights” and “reflex sights” interchangeably). A heavy pistol is often uncomfortable to use. They need to be shockproof to deal with the recoil. Next, they have to be accurate and have a dot large enough to easily see but small enough to avoid obscuring their target. Here are the 4 best pistol reflex sights we’ve found for you. They’re the best on the market. 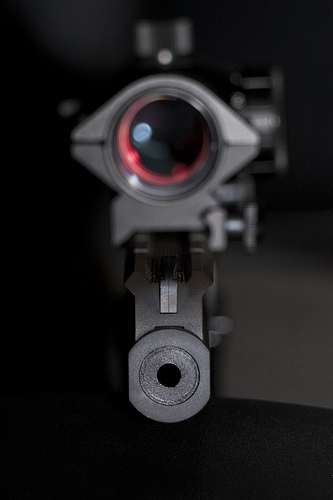 The Trijicon RMR is one of the original handgun reflex sights. It is certainly one of the most popular. The Trijicon RMR is an excellent, well built, war ready reflex sight. What’s fascinating is this optic was initially designed as a backup optic for assault rifles, sniper rifles, and even machine guns. It was popular for SMGs and shotguns as well. However, as handgun reflex sights became more and more popular, the Trijicon RMR was ready to go optic that filled the need of handgun shooters. 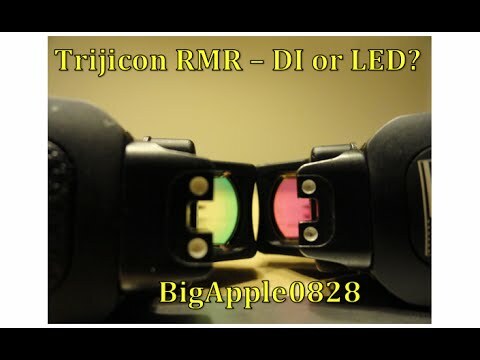 There are multiple options for the RMR, whether tritium/fiber optic (the one above) or the LED model (see it here). Since the latter sight uses an electric red dot, this requires a power source. The dual illuminated model above, however, uses both tritium and fiber optics. The RMR fiber optic can absorb light from the sun or any white light source to power the reticle. When the sun is down and lights are off, the tritium backup kicks in. This is certainly one of the best-built optics on the market. It’s built to withstand the wind, water, sand, and the shock and the abuse of war. The Trijicon RMR has set the current standard for handgun red dots, and it’s a high bar. The RMR can be used with a variety of different stock pistol mounts including Glock, the XD series, CZ, and more. It’s the best pistol reflex sight period. 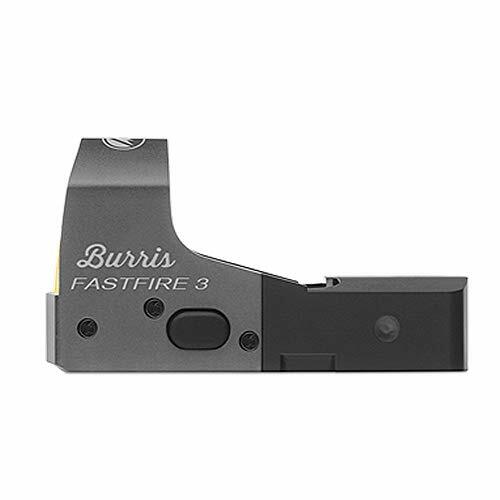 The Burris Fastfire is an excellent option for the shooter looking to compete in shooting sports at a good price. The Fastfire is a very-well made optic, and is perfect a handgun. It’s quite light, very strong, and simple to use. The price point makes it attractive for most new shooters looking to experiment with a red dot on their pistol. The Burris Fastfire has three generations under its belt, but the Fastfire 3 is easily the best incarnation. The Fastfire is designed to cut the time between holster to target and from target to target. The Fastfire uses a 3 MOA red dot that is large enough to easily catch the eye, but small enough to see small targets at a distance. The Burris Fastfire 3 also offer top access to the battery. This is a big deal for pistols. A lot of times when the battery is not on the top of the sight you have to remove the sight to change the battery. This can affect the zeroing of the weapon, and can be a serious pain to detach the optic, especially when LocTite is involved. 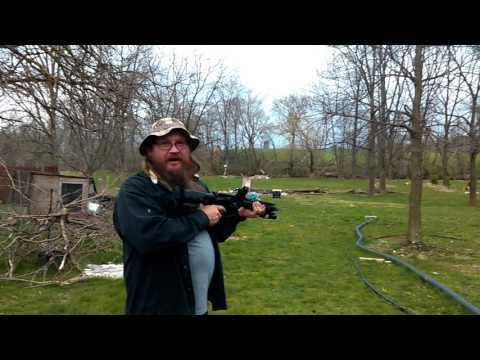 FastFire III Unboxing & Install – Inexpensive 3 MOA red dot! The Vortex Venom is Vortex’s entry into the pistol optic market. 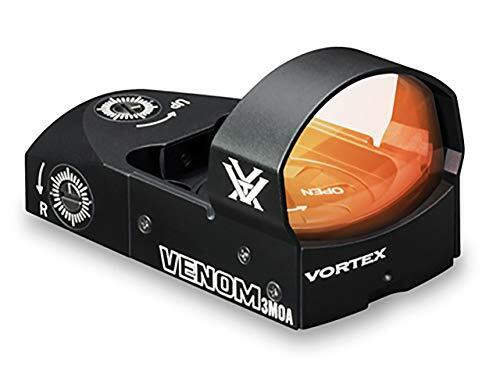 The Venom is a very well made optic, and is backed by Vortex’s awesome warranty. Vortex was smart enough to follow the popular Burris mounting system. This means the Vortex Venom can be mounted to any mount the Burris series can. The Venom is an all black model with an amber lens that helps the shooter gather light and gives a brighter look to the world. 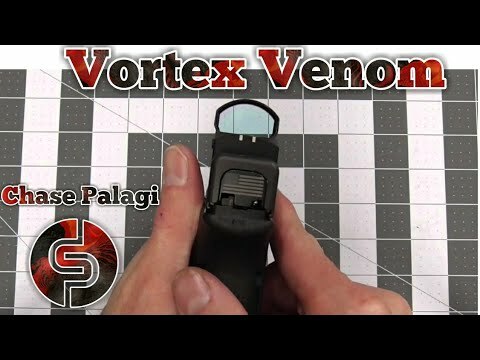 The Vortex Venom (see full specs) has a 3 MOA reticle, again, perfect for a handgun. The Venom has a wider lens than is round rather than square in shape. This gives the shooter a wider field of view than most handgun optics. The Venom gives shooters an excellent defensive optic that offers a lower profile but a wider field of view. The Vortex Venom also features a top-loading battery compartment, which is an all around excellent feature for a handgun reflex sight. The Venom has 10 different settings that allow the user to tailor their sight options. The optic is capable of lasting 550 hours at the lowest setting and has a 14 hours auto shut off. Hands down, this is one of the best pistol reflex sights on the market. 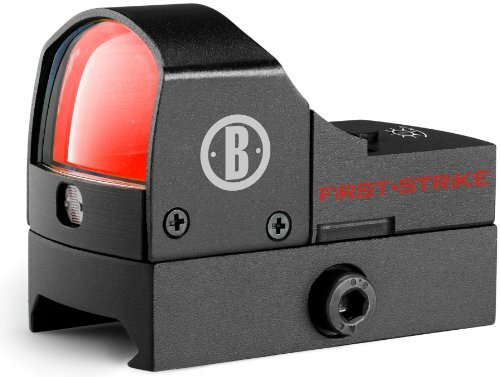 The Bushnell First Strike is one of the most affordable options for a pistol red dot sight. The Bushnell first strike is a well-made sight, that is perfect for the shooter on a budget. The First Strike is perfect for use with a small caliber handgun, like a .22. A Ruger Mark series pistol would be the perfect host for this optic. 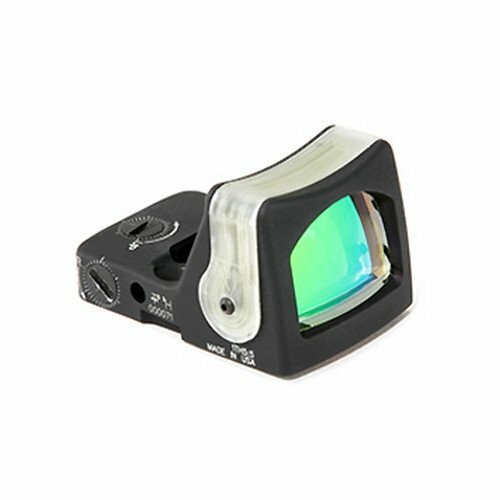 This optic serves as an excellent aid for those with bad eyesight but still enjoy shooting. The First Strike comes with a variety of different mounting options and risers so it’s ready to go out of the box. The Bushnell is affordable but is still waterproof, shockproof, and fog proof. The lenses are coated for superior light transmission and optic protection. Up to 100 yards, this bad boy is easy to use for all ages. It requires a Picatinny rail to mount, so keep this in mind when purchasing your pistol will need a mounting source. The Bushnell First Strike has a long battery life and automatically turns on and off when the protective cover is in place. The system automatically adjusts to the light as needed, which allows shooters to easily transition from an open field to a closed canopy. If you’re on a budget, this is likely the best pistol reflex sight for the money. Handgun red dots are extremely easy to use. In fact, they are actually easier to use than iron sights. Shooters using these sights are often capable of hitting targets further and faster. These sights are capable of working wonders for both experienced and new shooters. Good luck!